The Memory Foam Travel Neck Pillow has built in earphones and hood, that allows you to travel in comfort and privacy, whiling listening to your favorite tunes. Whether your journey involves trains, planes, or automobiles - our travel hooded neck pillow will allow you to enjoy your trip. The hooded neck pillow is made of comfortable memory foam that contours to your neck, providing maximum support every time you move. 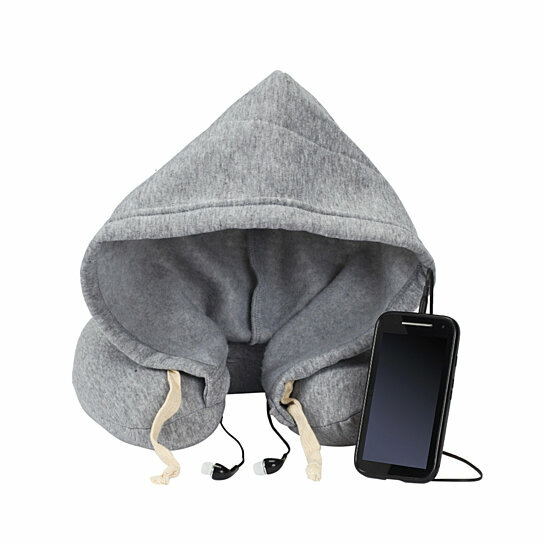 The adjustable drawstrings allow you to pull the hoodie over your eyes for complete privacy. And let’s not forget the music! The built-in earphones are great for listening to your favorite music while on the go.